Baileigh's R-H45 roller bender is the perfect ring roll for bending up to 2 inch Square X .120 inch wall, or 2 inch Schedule 40 pipe and much more. This ruggedly built machine only requires 220 volts of single phase power, so it is the perfect machine for any fabrication shop and can also be brought to most job sights. This tube roller come standard with a heavy duty steel plate frame that is tied to a large industrial motor and transmission that turns all three rolls. The housing is heavy duty as well and allows the roll bender to be tipped backward into the horizontal position when rolling larger diameters. 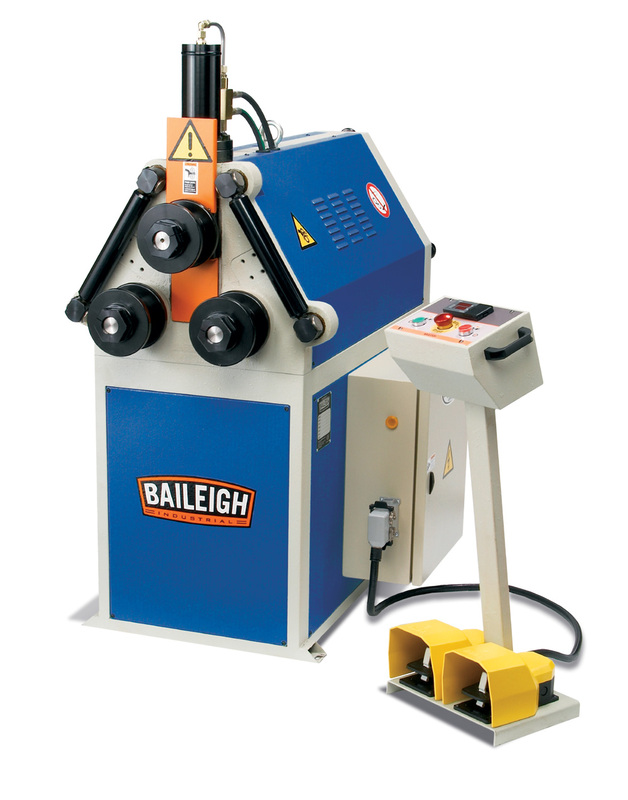 Like all Baileigh powered tube rollers, this machine comes with a Siemens® inverter drive that offers soft start ups for long motor life and overload protection to protect the mechanics of the machine. This tube roller comes standard with industrial grade hydraulics that powers the downward and upward position of the top roll. This section roll bender is programmable for the upward and downward position allowing for accurate repeatable bends every time. Our hydraulic tube rollers come standard with the segment rolls, lateral roll guides for coiling, operator pendant that houses operator buttons, DRO programmer and much more.